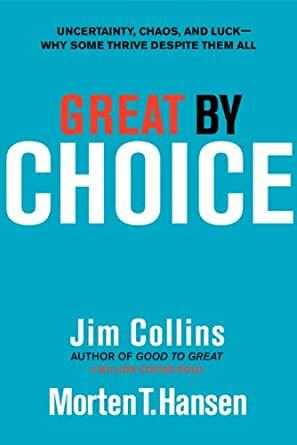 A major new book by the author of the international best-seller, Good to Great, Jim Collins. 5.0 out of 5 starsWill you choose greatness? In Collins' new book he relies on the method you've seen in previous books like Built to Last and Good to Great. What's different in this one is he selected companies not just on their status or explosive growth, but because they succeeded in an extreme and uncertain environment. However, there's a caveat here: his research stopped in 2002, meaning there's no thorough analysis of how companies performed in the last 10 years (aka one of the most uncertain and chaotic business climates in decades). Collins and Hansen believe the future will be unstable and environments will be extreme for the rest of "our lives" (remember, these guys aren't Spring Chickens). So, they try to analyze company performance/greatness within the context of difficulty. I always wish Amazon would show an easy-to-find Table of Contents for books, so I've created one for you here, complete with a summary of each chapter/section. Collins and Hansen explain what the method for their book (what I described above), including the definition of a 10Xer, which is a company that beat their industry by 10 fold. Just 7 companies were selected as a 10X case out of 20,400 companies. The seven are Amgen, Biomet, Intel, Microsoft, Progressive Insurance, Southwest Airlines, and Stryker. They don't include Apple because their research lens of Apple vs. Microsoft focused primarily on the 1980s and 1990s (remember they stopped collecting data in 2002), which makes no sense to me. The present environment (the one in which Apple has exploded) is a far more difficult climate than the 80s-90s. Example of a 10xer is Southwest airlines, whose growth since 1972 is greater than that of Walmart, despite this period being a particularly harsh one for the airline industry. Anecdotes describe historic examples of 10xers and explains they aren't more creative, more visionary, more charismatic, or more ambitious, more blessed by luck, more risk seeking, more heroic, or more bold. The glaring fact that Apple is missing goes against this model, as Jobs and company were many of these things. Here they introduce discipline as the key that sets 10Xers apart (hence the 20 mile march). 10Xers are focused on data with GREAT discipline and stick to their plan, like a 20 Mile March. 10Xers were not more innovative than the control companies; indeed, they were considered less innovative in some comparisons. 10Xers scale innovation (firing bullets) and then the fire cannonballs once they know what's on target. Explains "productive paranoia," the idea that you need to build cash reserves and buffers, bound your risk, and show flexibility in looking at macro and micro factors at play in your business and industry. SMaC stands for Specific, Methodological, and Consistent. The more uncertain your environment, the more SMaC you need to be. A SMaC recipe is a set of durable operating principles and practices that create a replicable and consistent success formula. 10Xers weren't more lucky or unlucky than comparisons. They had better ROL because they took full advantage of good luck and minimized the effects of bad luck. If you think about it, that's the real key to luck. Knowing when you got lucky and how to take advantage of it, rather than blindly thinking you walk on water (like so many businesses do). 315 people found this helpful. A couple of years ago, I picked up Jim Collins and Morten Hansen’s book Great by Choice: Uncertainty, Chaos, And Luck – Why Some Thrive Despite Them All to check a few facts. Two hours later, I was still reading. Recently, that happened again. I realized that I never reviewed Great by Choice for my website, so I picked it up and, just like the last time, found myself still reading a couple of hours later. 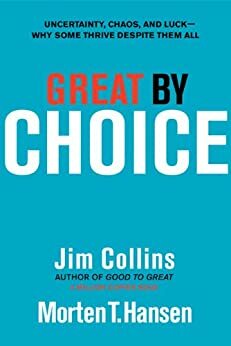 I think Great by Choice is, Jim Collins’ best book. The partnership with Morten Hansen makes the reasoning tighter and the research a bit broader than in Collins’ other books. Here’s the authors’ statement of what they want the book to achieve. The opening chapter, Thriving in Uncertainty, is an introduction to the book. The research is typical Jim Collins. He went looking for enterprises that had great performance over many years in a particularly turbulent environment and that started from a position of vulnerability. In this chapter, the authors share their findings about five what they call “entrenched myths” that were disproved by their research. Here are the myths. 1. Successful leaders in a turbulent world are bold, risk-seeking visionaries. 2. Innovation distinguishes those companies that succeed in a fast-moving, uncertain and chaotic world. 3. A threat-filled world favors the speedy. 4. Radical change on the outside requires radical change on the inside. 5. Great enterprises have a lot better luck than other enterprises. All of those, are false. So, what is this book about? It’s simple, Great by Choice will prepare you to succeed in a world that you cannot predict. Chapter two is “10Xers.” That’s what the authors call the super successful and adaptable companies that they studied. The core of the chapter is the story of Roald Amundsen and his race to the South Pole. Next, they define 10X leadership as three important things: fanatic discipline; productive paranoia; empirical creativity. Every chapter ends the same way. There’s a summary of key findings, of course, but also unexpected findings and another part called “One Key Question,” which they suggest you answer. This all made sense to me. I’m a proponent of getting a little better, pushing forward, and making a little progress every day. The finding that I found surprising and helpful was that the idea of the 20-mile march also includes not pressing too hard ahead when conditions are good. It’s a continued steadiness. When times are good, stick to your discipline. Don’t try to go explosive. This is what I learned in my early direct-response career. You test things. When those things work, you expand a little bit, but you also understand that many of the things you test won’t work. Chapter six is about “SMaC.” SMaC stands for Specific, Methodical, and Consistent. The lessons in this chapter were a lot like the ones in “20-Mile March” chapter. The key point is that in an uncertain, fast-changing environment, you need to be specific, methodical, and consistent. As with every book with Jim Collins’ name on the cover, this one is superbly written with dozens of well-told stories, liberally seasoned with facts. What makes this book special is the tightness of the reasoning and the phrasing of the research. The big plus of this book, for me, was that this is not only about organizations. You can apply the things you find here to a career or a project or just about any part of life. You’re going to have luck. It’s what you do with it that matters. To find out how to do the best possible job dealing with the luck you get, read Great by Choice. 3.0 out of 5 starsDecent book, but repetitive and just like his previous books. This is an ok book with many of the same stories and themes from Jim Collins' previous books. If you've read those, I wouldn't recommend also reading this. While many of the themes are sound advice and good stories of past successes and failures, the book begins to feel repetitive and hollow about a third of the way in. 5.0 out of 5 starsUseful for small or large businesses... GREAT book! Fantastic book filled with practical biz processes and strategies. We used many of these principles daily, but it's good to see them confirmed, see other perspectives, and learn new info. Highly recommend this to anyone building any kind of business - large or small. (Too, these are things that can be applied to your personal/family life). Great book!